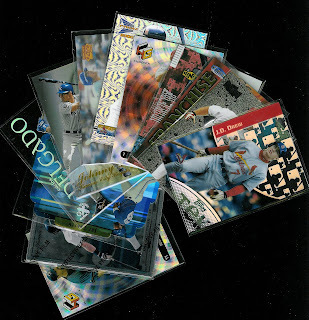 Voice of the Collector: My Mom Rescued a Hoarder- Need Late 90's - Early 00's Player Lots? My Mom Rescued a Hoarder- Need Late 90's - Early 00's Player Lots? So my Mom has a friend who is a bit of a hoarder. Not quite as bad as those on the TV show but let's just say I'm glad that getting these boxes out of my Mom's trunk was the extent of my involvement. There were several boxes of kindling as would be expected, but there were also (2) 3,000 count boxes with some great player lots with cards from the late 90's and early 2000's. Most lots range from 35-50 different cards and include brands like, Metal Universe, Skybox, Gold Label, Showcase, EX, Finest, Laser, Tek, SPx Holo, Holographix, Ionix, Gallery, Bowman's Best, HD, Prism, Private Stock, Leaf Steel and more. I know this isn't eBay but there is some good stuff in here and I want my readers to have first shot. If you are interested let me know at thevotc@gmail.com and I'll get you specifics and pricing. Lots are either $5, $7, or $10 unless noted above and pricing is based on the quantity and cards included.